Dr. Van Laake is Assistant Professor and Cardiologist specialized in heart failure (European certification). 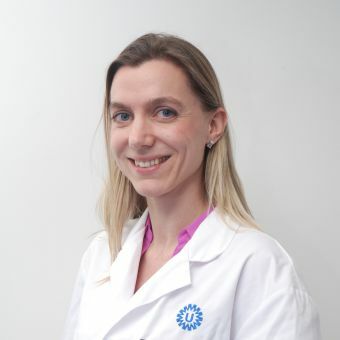 She obtained her Medical Degree at Maastricht University in 2004 and her PhD at the Hubrecht Institute and UMCU, studying stem cell transplantation for cardiac regeneration. From 2007-2009 she did postdoctoral research on cardiac progenitor cells and microRNAs in heart repair at the University of California San Francisco with Prof. D. Srivastava. In 2011 she was awarded a Veni grant by NWO to start her research line on circadian rhythms in heart repair and in 2012 she won the Heineken Young Scientist Award for Medicine, of the KNAW for her research accomplishments so far. Other research support includes a Netherlands Heart Foundation Dekker grant (2013), UMCU Clinical Research Talent Fellowship (2014) and a European Society of Cardiology Research Fellowship (2016). Dr. Van Laake is active within the European Society of Cardiology (Nucleus Member of the Working Group on Cellular Biology of the Heart) and European Heart Failure Association (Member of the Translational Committee), and was a founding member of the Jonge Gezondheidsraad, an advisory body to the government and Parliament on the current level of knowledge with respect to public health issues and research. “Using fluorescent and bioluminescent reporter systems, we are unraveling the physiological and pathophysiological meaning of circadian oscillations in cardiac progenitor cells and stem cell-derived cardiomyocytes in vitro and in vivo after transplantation in regenerative therapies. In addition, we study regeneration-related functional aspects of circadian oscillations in the normal and failing heart in humans and in mice. In vitro models of human heart tissue enable us to observe and manipulate the interaction of host and donor factors that are under control of the circadian clock.” Combing a variety of novel approaches together with a greater understanding of how heart development and repair work, Dr. Van Laake and her team strive to create better personalized heart failure therapies. L.W. Van Laake*, R. Madonna*, S.M. Davidson, F.B. Engel, D.J. Hausenloy, S. Lecour, J. Leor, C. Perrino, R. Schulz, K. Ytrehus, U. Landmesser, C.L. Mummery, S. Janssens, J. Willerson, T. Eschenhagen, P. Ferdinandy, J. P. Sluijter. Position Paper of the ESC Working Group Cellular Biology of the Heart: Cell-Based Therapies for Myocardial Repair and Regeneration in Ischemic Heart Disease and Heart Failure. European Heart Journal 2016; 37(23):1789-98. P. Dierickx, B. Du Pré, D. Feyen, N. Geijsen, T. Van Veen, P.A. Doevendans, L.W. Van Laake. Circadian rhythms in stem cell biology and function. In: Stem Cell Biology and Regenerative Medicine, Springer. 2016:57-78. B.C. Du Pré, T.A. van Veen, M.E. Young, M.A. Vos, P.A Doevendans, L.W. van Laake. Circadian rhythms in cell maturation. Physiology. 2014; 29(1):72-83.